Ask RP Photonics for any advice on lasers, e.g. concerning design optimization, power efficiency, or stability issues. The pump parameter r of a laser is the ratio of pump power and threshold pump power. Usually, this quantity is used for optically pumped lasers. For small pump parameters (close to 1), the power efficiency is reduced, the output power depends strongly on the pump power, and the relaxation oscillations are weakly damped. For very large pump parameters, diffraction-limited beam quality is often difficult to achieve (at least in bulk lasers), since e.g. 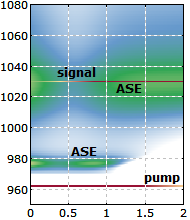 small tails of the pump intensity profile can excite higher-order modes. Also, the power efficiency may be degraded due to the strong influence of parasitic resonator losses. 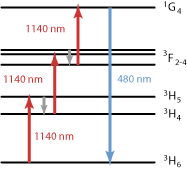 Some single-frequency lasers have to be operated with small pump parameters, because additional resonator modes would start to oscillate for stronger pumping. Passively mode-locked lasers often have to be operated far above threshold in order to suppress Q-switching instabilities. High-power fiber lasers are often operated far above threshold simply because the threshold power is very low, even with strong output coupling. Particularly in the context of four-level lasers, it can be convenient to use the pump parameter r in equations, as it is most easy to evaluate in an experiment, and thus often well known. In four-level lasers, the intracavity optical intensity in the gain medium (in the steady state, assuming a flat-top mode profile) is (r − 1) times the saturation intensity. Also, there is a simple equation for the frequency of relaxation oscillations, containing the parameter r. However, such equations then often do not hold for (quasi-)three-level gain media.